For years I drove cross-country, back and forth a dozen times, sometimes on book tour, sometimes just to get lost and found. There was the spring I stayed in Livingston, Montana, for three weeks at the Murray Hotel, in a suite once occupied by film director Sam Peckinpah. There were bullet holes in the ceiling from one night in the early ’80s when Peckinpah went on a drunken tear. I’d been loaned the suite by its then owner, a writer with whom I was enmeshed in a flirtation. He was staying in another room, next door. I was supposed to be working on a new novel, and I did, but I also was busy drinking nightly at the bar downstairs—drinking the cheapest whiskey at as seedy a bar as you could find in a hotel—and buying beautiful cowboy boots from a nearby western store. 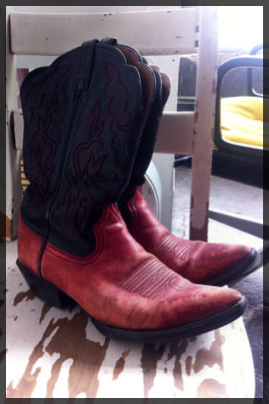 Beautiful red cowboy boots. One night, a member of an iconic ’90s indie-rock band passed through town on a road trip, and I moved on from the writer to him when he told me the exceptionally dirty tale of how he had lost his virginity. I was wearing my boots with a flowered ’50s-style vintage dress. There was a collection of punk-rock vinyl in the suite. We stayed up late while he played them for me. I remember jumping up and down in those cowboy boots with him until finally we collapsed in bed. After that, I wore those boots everywhere, throughout my travels all over the country. Even when they weren’t necessarily appropriate, I got compliments. There are polite flats and there are poised heels and there are sweet oxfords, and then there are cowboy boots. They signify a certain thing to—and about—a woman: They are rugged and free, and they look better with age and a little dirt on them. They have a long life-span. They make you feel invincible. Not to mention that my boots were red, a harlot’s color but also one you’d see on a flag: bright, powerful, a blazing, strong voice. For years I’d thought my color was black: deep, dark, thoughtful, mysterious. Black, you can hide behind. But now I know it is red. I’ve had the boots resoled twice. The red is worn off at the toes. A few years back I broke my ankle, and they no longer sit quite right on my foot. I don’t wear them as often as I used to, but I don’t drive cross-country every year now either. (I have less free time and more frequent-flier miles.) But I can’t bring myself to throw them away. Sometimes I take them on trips even when I have no room in my suitcase and really should know better, just because I like knowing they’re there. And sometimes I wear them with a dress in the summertime and pretend I’m still in Montana.